The launch party for Christmas Stalkings is on December 7, 2016 at the McConnell Library in Sydney. 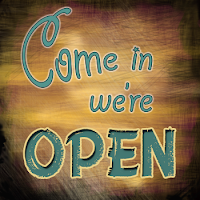 Come early, as books will go on sale at 6:30 and the program starts at 7. There will be new stories from Todd Pettigrew and Ken Chisholm, readings from the book by Jenn Tubrett, entertainment from the Endnotes and a silent auction benefiting the McConnell Library's New Horizons Seniors' Book Club. Also, refreshments! 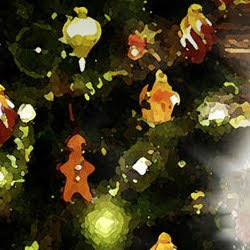 Christmas Stalkings features a selection of the original stories told at the McConnell Library's Gaudy Night fundraisers over the last five years. 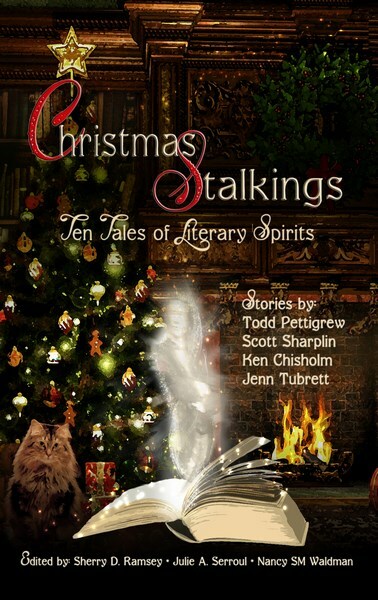 Written by Todd Pettigrew, Scott Sharplin, Ken Chisholm and Jenn Tubrett, the anthology—available in print and ebook—spotlights excellent Cape Breton writing and storytelling and celebrates not only Christmas and ghosts, but also literature, illustrious writers, libraries, history, books, humour and word play. Contact us or the library (Chris Thomson)for more information. Christmas Stalkings, Ten Tales of Literary Spirits -- featuring stories by local legends Todd Pettigrew, Ken Chisholm, Scott Sharplin and Jenn Tubrett! In the spring of 2016, Chris Thomson of the McConnell library, approached Third Person Press about whether we’d be interested in looking at this collection of stories that were originally written to be told at Gaudy Night fundraising celebrations over the last several years. 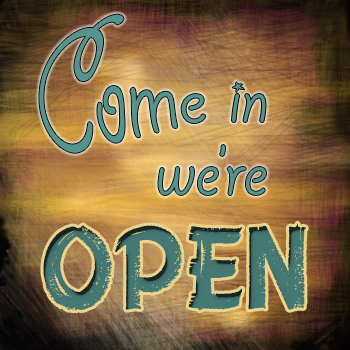 At the time we were technically open only to novel submissions, but when we heard who had authored these stories we were definitely interested in reading them. It took very little time for us to know that this was an unusually clever, cohesive, and unique set of stories—ones that celebrate not only Christmas and ghosts, but also literature, illustrious writers, libraries, history, books, humour and word play. How could we resist? There is something special about stories told in the oral tradition. A freshness in the approach. An immediate intimacy that the written word can sometimes leave behind. The stories in this volume were first written down, of course, but the writers knew they would be presenting them aloud, and as a result, they each reflect the relationship with an audience they were entertaining. Third Person Press had great fun pulling it together (including a spirited cover designed by Sherry and ghostly interior illustrations by Nancy). We see Christmas Stalkings becoming a classic, not only to Cape Bretoners, but also to those off-Island who have yet to fully discover the prodigious talent that thrives here. 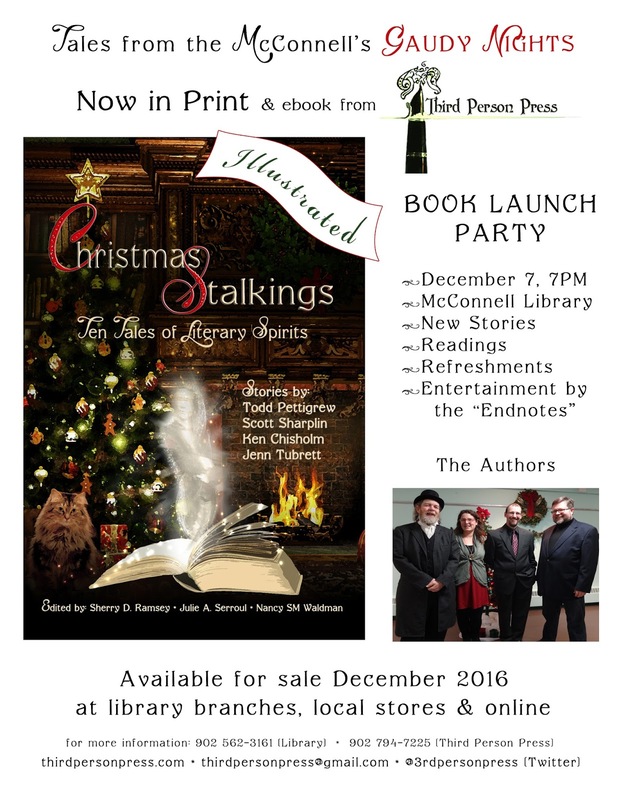 A Gaudy Night Book Launch party is scheduled for December 7th at the McConnell Library in Sydney, Nova Scotia. Stay tuned for more information. Write to us at thirdpersonpress@gmail.com to reserve your copies.